U.S. President Donald Trump arrives aboard Air Force One at Noi Bai International Airport in Hanoi, Vietnam November 11, 2017. U.S. President Donald Trump heaped praise on Vietnam Saturday, saying the southeast Asian nation is "one of the great miracles of the world." Trump's remarks were made at a state banquet in the capital of Hanoi, the latest event on his five-country Asian tour. Trump, who arrived in Hanoi Saturday, told dignitaries he toured parts of the country, which he said "is really something to behold." After the nearly 20-year Vietnam War that killed millions of people, the country's economy has been among the world's fastest growing since 1990. Its gross domestic product has grown nearly 6.5-percent annually in the 2000s, according to the World Bank. On Sunday Trump is to have meetings with Vietnamese President Tran dai Quang and other leaders. Enroute to Hanoi aboard Air Force One, Trump reiterated to reporters traveling with him that he discussed with APEC leaders bilateral agreements that have resulted in trade imbalances he says are disadvantageous to the U.S.
"It’s disgraceful. And I don’t blame any of those countries. I blame the people we had representing us who didn’t know what they were doing because they should have never let that happen." At the close of the APEC meeting, the 21 member nations issued a statement expressing support for free trade and closer regional ties, without any mention of Trump's 'America First' doctrine. Trump told the APEC CEO Summit that he is willing to make bilateral trade agreements with any country in the Indo-Pacific region, but he firmly rejected multi-national deals such as the 12-nation Trans-Pacific Partnership, which was quickly abandoned in the first days of his administration. Leaders pose during the photo session at the APEC Summit in Danang, Vietnam, Nov. 11, 2017. 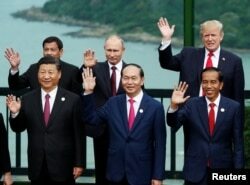 Front, from left, China's President Xi Jinping, Vietnam's President Tran Dai Quang, Indonesia's President Joko Widodo; back, from left, Philippines' President Rodrigo Duterte, Russia's President Vladimir Putin and U.S. President Donald Trump. "I will make bilateral trade agreements with any Indo-Pacific nation that wants to be our partner and that will abide by the principles of fair and reciprocal trade," Trump said. "What we will no longer do is enter into large agreements that tie our hands, surrender our sovereignty, and make meaningful enforcement practically impossible." The U.S. president said that in the past when his country "lowered market barriers, other countries didn't open their markets to us." From now on, however, Trump warned the United States will, "expect that our partners will faithfully follow the rules. We expect that markets will be open to an equal degree on both sides and that private investment, not government planners, will direct investment." But making that happen is something that is easier said than done. China has already shown that it has no intention of playing by the rules, said Fraser Howie, co-author of the book Red Capitalism: The Fragile Financial Foundation of China’s Extraordinary Rise. "China has been in WTO terms simply much sharper and smarter than the Americans," Howie said. "While the Americans went in with good faith thinking the Chinese would change and whatever, the Chinese never had any intention of changing." Howie added that trade and access issues are difficult and sophisticated, and so far Trump has a poor track record when it comes to follow through - be it his travel ban, the wall, healthcare or tax policy. "Yes you're going to get tough on them, but how do get tough without penalizing them," he said. He added, "how can China be penalized when Xi Jinping is your best mate? It doesn't make any sense." President Xi, whose country's rise has been driven greatly by large-scale government-planning, immediately followed Trump on the stage in Da Nang. Xi embraced the multilateral concept, in particular calling for support for a Free Trade Area of the Asia-Pacific (FTAAP), which would harmonize regional and bilateral economic pacts. China was left out of the TPP, which was led by the United States and Japan, and was meant in great part as a bulwark against China's strategic ambitions. Xi also termed globalization an irreversible trend, but said the world must work to make it more balanced and inclusive. The speeches came just hours after Trump left China where he and Xi met several times on Wednesday and Thursday. In Beijing on Thursday, the U.S. president had struck a markedly softer tone than in the past on touchy subjects such as North Korea and trade saying he had an "incredibly warm" feeling for Xi. Trump noted the U.S. must change its policy. "It's too bad that past administrations allowed it go get so far out of kilter," said Trump. "But we'll make it fair, and it will be tremendous for both of us." The Chinese leader said Beijing's relationship with Washington "now stands at a new starting point" and vowed to "enhance communication and cooperation on the nuclear issues on the Korean Peninsula" and other issues. "For China and the United States, cooperation is the only viable choice, and win-win cooperation can take us to a better future," said the Chinese president. Much of Trump's Asia tour has focused on North Korea, which is developing a nuclear and missile program in violation of U.N. Security Council resolutions. Trump pressed Xi privately on the North Korea nuclear issue, according to Trump administration officials. According to Secretary of State Rex Tillerson, Trump told Xi, "You're a strong man, I'm sure you can solve this for me." Speaking in Beijing, Tillerson noted "there is no disagreement on North Korea" between the United States and China. The diplomat pointed out the Chinese have been clear and unequivocal over two days of talks that they will not accept a North Korea with nuclear weapons. "There's no space between both of our objectives," said Tillerson. "We have our own views of the tactics, the timing and how far to go with pressure and that's what we spend a lot of time exchanging views on."